If you experience hot flashes, you are probably looking for a way to help reduce your hot flashes as much as possible. While there are prescription medications available to help manage hot flashes, many are not approved by the Food and Drug Administration (FDA) for menopause-related conditions, and they may have more serious side effects. If you want something natural, consider the herb black cohosh for hot flashes relief. There have been many studies evaluating the effectiveness of black cohosh for menopause symptoms. Unfortunately, even despite the many studies performed, there is no consensus on whether black cohosh has a significant effect on menopause symptoms, including hot flashes. While some studies have found no difference between the frequency of hot flashes experienced by women taking black cohosh and by women taking a placebo, German studies found black cohosh improved physical and psychological menopausal symptoms, including anxiety, hot flashes, night sweats, and vaginal dryness. However, the differing results require further scientific studies. Studies have found varying results for the plant's effects on human physiology as to whether, for example, it raises the body's levels of estrogen, luteinizing hormone, or follicle-stimulating hormone, which are all present in lower levels in menopausal women than in premenopausal women. In a study of 120 women with the menopausal symptoms, black cohosh was more effective in relieving hot flashes and night sweats than antidepressants. Finally, most clinical studies conclude that black cohosh may be a safe and effective alternative for women who cannot or will not take hormonal replacement therapy (HRT) for menopause. Black cohosh is a non-toxic herb that has been shown to be remarkably safe for consumption. Some studies have followed women taking black cohosh for hot flashes for up to 12 months, and the worst side effects were upset stomach or rashes. However, although it has mostly been found safe, there are still a few cautions to keep in mind. Some people taking commercial products that contain black cohosh have experienced severe liver damage. It is unclear whether the black cohosh was responsible for the damage, or whether another ingredient in the preparation was at fault. These cases are also very rare, but you should stop using black cohosh immediately if you experience symptoms such as jaundice, abdominal pain, or dark urine, which all signal liver damage. Additionally, some commercial black cohosh products contain no black cohosh or other harmful ingredients. Sometimes, these products contain other ingredients that are not even listed on the label of the product. Do research before purchasing any black cohosh product to ensure you are receiving the best product without any other potentially harmful ingredients. 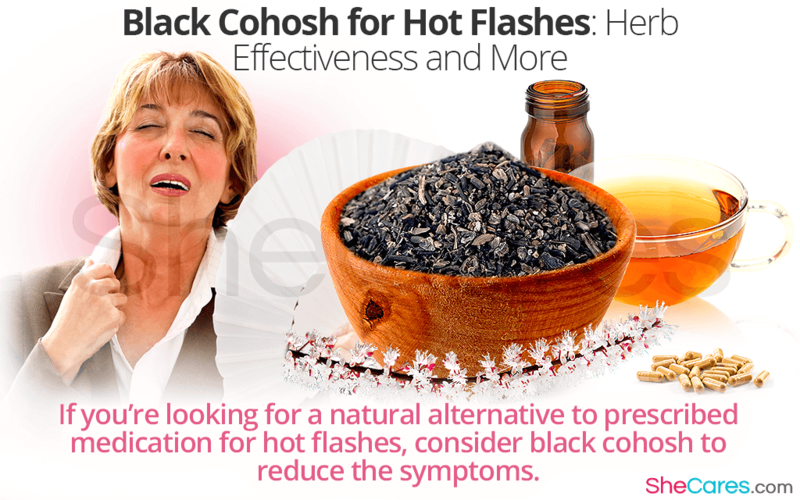 Knowing more about black cohosh for hot flashes can help you decide what treatment option is best for you. If you want to know more about herbal treatments, read about the top 5 natural remedies for hot flashes.